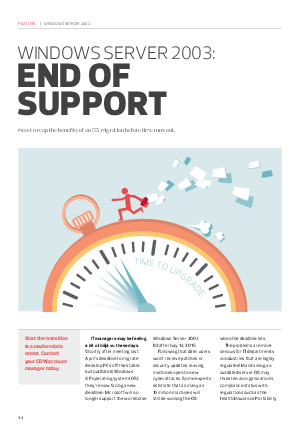 With the end of Microsoft support to Windows Server 2003 the time is now to make a plan to upgrade your server before it is too late. Getting a quick jump on the transition to a modern data center will enable your organization to take full advantage of the newest technologies. Download this whitepaper to learn how to reap the benefits of an operating system migration and see how your organization can fully benefit.